Wall Art Print Beautiful artistic portrait of a young woman in red long summer dress flying in the wind standing on a rocky shore in sunset looking at the ocean, rear view This photo is available as a framed, unframed, canvas, acrylic print, wall tapestry or a greetings card in a variety of sizes. 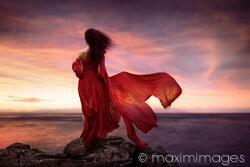 This artistic photo, 'Woman in red dress flying in the wind looking at the ocean in sunset' from our Wall Art collection, is created by Alex Maxim and can be purchased as a fine art print in a variety of paper finishes, framed with a mat or unframed, as well as a beautiful gallery wrap format canvas print. In addition to prints, we offer other options of Wall Art, such as having this artwork printed on a fabric Wall Tapestry, a stylish Acrylic panel or it can be bought as simple elegant gift cards. Please see all the available options in the 'Finish' drop-down menu. A large selection of sizes is available, and in addition to that, we are open to custom orders, whether you want a customized size, crop, image coloring, or maybe to have this image printed on a different product, like a T-shirt, a duvet cover, a cushion, a yoga mat etc., we are here to help you. Please 'Inquire' for all available options and products.